Ottawa – Your chance of having a heart attack or stroke increases significantly if you have been hospitalized for pneumonia, according to a paper published today in the influential JAMA (Journal of the American Medical Association). 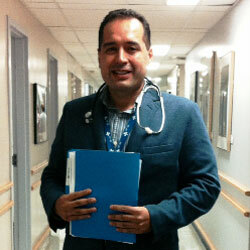 "The main conclusion from our study is that someone hospitalized for pneumonia should be considered at greater risk of developing cardiovascular disease," said lead author Dr. Vicente Corrales-Medina, an infectious diseases physician and researcher at The Ottawa Hospital, and assistant professor with the University of Ottawa's Faculty of Medicine. "Second, once pneumonia has occurred, physicians should develop a care plan understanding that these patients are more likely to develop cardiovascular disease in the weeks, months and years following their recovery from this infection," added Dr. Corrales-Medina. "Such measures could include screening and primary prevention strategies for cardiovascular disease." While other studies have made the connection between pneumonia hospitalization and cardiovascular disease, this is the first to only look at pneumonia patients with no previous history of cardiovascular disease while also taking into account the effect of other established cardiovascular risk factors. By doing so, their results strongly indicate that hospitalization for pneumonia should be considered its own risk factor for future cardiovascular disease. The JAMA paper was a collaboration with Dr. Sachin Yende, who is an associate professor at the University of Pittsburgh and director of the Clinical Epidemiology program at its CRISMA Center. It used records of 3,813 people from two community health studies, both based in the United States. One enrolled participants aged 65 and older and the other enrolled participants aged 45 to 64. The JAMA study analysed health data of 1,271 pneumonia patients against 2,542 control patients (matched by age) over a period of 10 years. Results showed that these pneumonia patients had a raised level of risk for cardiovascular disease over the entire 10 years, with the highest risk experienced in the first year. For example, in the group aged 65 and older, a pneumonia patient was four times more likely to develop cardiovascular disease in the first 30 days following the infection. In the tenth year, they were a little less than twice as likely to develop cardiovascular disease. Another way of looking at it: The 10-year risk of developing cardiovascular disease for a 72-year-old woman with two cardiovascular risk factors (hypertension and smoking) increases from 31% to 90% if she is hospitalized for pneumonia. Results from the group aged 45 to 64 showed that the risk was higher in the first two years, but not significantly raised after that. In this younger group, a pneumonia patient was 2.4 times more likely to develop cardiovascular disease in the first 90 days after the infection. Dr. Corrales-Medina's current research is focused on trying to determine what biological mechanisms are responsible for this raised risk of cardiovascular disease after pneumonia, in order to develop therapies to prevent the subsequent onset of cardiovascular disease. Cardiovascular disease is considered the most common and deadly disease group in Canada and around the world. In 2008, according to Statistics Canada, cardiovascular disease accounted for 29% (69,703) of all deaths in Canada. Of those deaths, 54% were due to ischemic heart disease (caused by narrowing of the arteries to the heart), 20% to stroke and 23% to heart attack. The paper "Association Between Hospitalization for Pneumonia and Subsequent Risk of Cardiovascular Disease" was published online today by JAMA. Dr. Corrales-Medina worked on this paper with a team from the University of Pittsburgh. The senior author is Dr. Sachin Yende, with the Clinical Research Investigation and Systems Modeling of Acute Illness (CRISMA) Center at the University of Pittsburgh. Funding for this paper was provided by National Heart, Lung and Blood Institute (CHS and ARIC), National Institute of Neurological Disorders (CHS) and Stroke, National Institute on Aging (CHS), The Ottawa Hospital Foundation, The Ottawa Hospital's Department of Medicine, and National Institute of General Medical Sciences. The Ottawa Hospital Research Institute is the research arm of The Ottawa Hospital and is an affiliated institute of the University of Ottawa, closely associated with its faculties of Medicine and Health Sciences. The Ottawa Hospital Research Institute includes more than 1,700 scientists, clinician investigators, graduate students, postdoctoral fellows and staff conducting research to improve the understanding, prevention, diagnosis and treatment of human disease. Support our research. Give to the Tender Loving Research campaign.